Well, at least they won't be UFOs for long. Seriously - don't laugh. I have DEADLINES for these!! This one is going to a friend who is retiring on Friday the 21st. Yes, you read that right. This coming Friday. 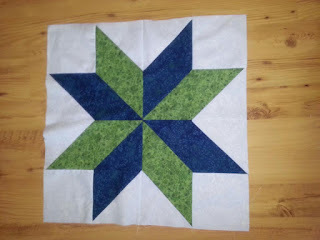 I've made 4 of these blocks - thank you to Missouri Star Quilt Co for the amazing and easy tutorial. When it's done (no later than Friday!!) It'll be 52x52. This picture was taken before I added sashing - so it's bigger now. And this one is for a good friend of mine who just had a little girl. Since I took the picture, I've evened up each side and added a 3 inch light green border. 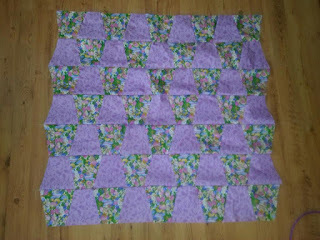 Now all I need to do is quilt it. It's all sandwiched. My idea is to quilt the babys name in the purple tumblers and loose stipple in the bunny. 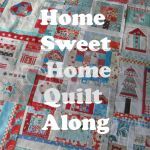 Once it's done the quilt is getting shipped off to the adorable girl in Ireland.